See your data and gain valuable insight! It’s hard to argue that one graph is a lot more useful than a thousand lines of data. Anyone who says different is living in crazy town. Regpack enables you to generate statistics for whatever data you want. If you need to see a breakdown of certain aspects of any project, broadly or specifically, the system will produce simple and easy to understand graphs. When you need to clearly visualize how many males and females make up one project, the stats feature will paint the picture. You can even run statistics on filters you created (how cool is that?). If the marketing department wants to visualize where the majority of applicants are coming from to better understand their marketing campaigns, Regpack can draw up the statistics and easily filter which applicants came from Facebook, Google ad’s, or from a general search. Feedback from your applicants is the best way you can know what you’re doing right and wrong. But you do not always have the time and resources to talk to every applicant and when you do you want to talk about your project, not your registration process. Regpack enables you to track user actions and learn from them. Better yet, it will aggregate the information and give you the tools to know where are the positives and the pitfalls of your registration process. The statistics generated from each applicant’s experience with the process can help you figure out what is working and what’s not. This translates to less time wondering why applicants aren’t finishing a certain section and more time proactively improving the process. Once you know what is broken, you can fix it with only a few clicks of your mouse. With more people smoothly passing through the steps of registration you’ll see more completed applications. The ability to visualize your data is incredibly valuable. 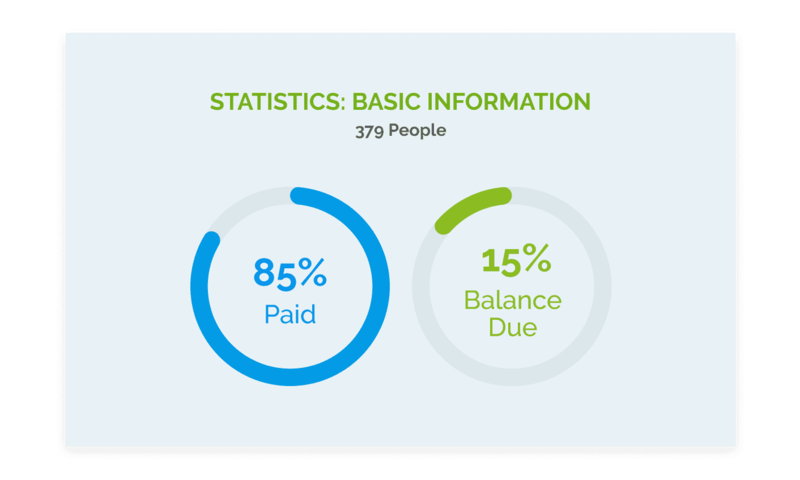 The ability to summarize your information in an concise and visual way helps ease the burden of tons of information. With a graph breaking down information you need, you won’t have to strain your eyes and skim tons of application data in order to extract the information that is relevant to you. Any department can easily and quickly get the stats they need to continue their projects – from understanding how many payments are received versus how many payments are outstanding to which applicants will extend their services past a certain date. Regpack’s statistical engine coupled with the amazing filtering power allows you to reach a new level of professional maturity. With Regpack you can access all the information on all of your applicants whenever, wherever and however you need. Our camp registration is no simple process so I decided to make the jump to an online registration system. We have so many price points, discounts, and add ons that it made the process complicated but you would never know by how amazing Regpack has been! Their customer service is outstanding and they make you feel like everything is achievable!